Survivor: "I closed my eyes and prayed and waited to die"
Deborah Kiley and her friend, Brad Cavanaugh, spot their rescuers after five terror-filled days in the ocean. Those who seemed best suited for survival -- the strongest or most skilled -- were often the first to die off in life-or-death struggles, he says. Experience and physical strength can lead to carelessness. The Rambo types, a Navy SEAL tells Gonzales, are often the first to go. Small children and inexperienced climbers, for example, often survive emergencies in the wilderness far better than their stronger or adult counterparts, he says. They survive because they're humble, Gonzales says. They know when to rest, when they shouldn't try something beyond their capabilities, when it's wise to be afraid. "Humility can keep you out of trouble," Gonzales says. "If you go busting into the wilderness with the attitude that you know what's going on, you're liable to miss important cues." Survivors tend to be independent thinkers as well. When hijacked planes hit the World Trade Center during the September 11, 2001, terrorist attacks, hundreds of workers were trapped in the towers. Gonzales says security told many of them to stay put and wait for rescue. Most of those who heeded the directions from security died, he says. Most of the survivors decided to ignore security protocol. They headed downstairs through a smoke-filled stairwell and didn't wait to be rescued. "They were not rule followers, they thought for themselves and had an independent frame of mind," Gonzales says. Survivors also shared another trait -- strong family bonds. Many reported they were motivated to endure hardships by a desire to see a loved one, Gonzales says. Gonzales cites the story of Viktor Frankl, author of "Man's Search for Meaning." Frankl survived three years in Auschwitz and other Nazi death camps because he was driven by the thought of seeing his wife again. "He spent a great deal of time thinking of his wife and motivating himself through his wife," Gonzales says. Survivors also pay attention to their intuition, Gonzales says. If something tells them that the mountain isn't safe to climb that day, they'll back out even if they've planned the trip for months, he says. Gonzales followed his intuition once and it saved his life. In 1979, a writing colleague asked him to fly with him on a flight from Chicago, Illinois, to Los Angeles, California. Gonzales declined when he learned that he would fly on a McDonnell Douglas DC-10, which had a spotty safety record. His decision was unusual -- a boss personally asked him to fly with him that day -- but he stuck with it. Gonzales says he was sitting in his kitchen later that day when someone called him and told him to turn on his television. The plane he was supposed to be on had just crashed on takeoff, killing all 271 people onboard, including several of Gonzales colleagues. It was one of the worst aviation disasters in the nation's history. Knowing what to do was not enough for him, Gonzales says. "It's a story about having the information and using it," he says. "So when this trip came up, I was prepared to do something out of the ordinary." Kiley, now 50, also had misgivings about going on the trip that almost cost her life. It was October 1982 and she was 26 years old when she boarded a sailing yacht in Maine. She joined three men and another woman who planned to sail to Florida. But there were signs early on that the trip would not be smooth. The men bickered, the yacht's captain was lazy, and the ship wasn't properly maintained, Kiley says. The yacht was soon caught in a fierce storm. It was tossed by 60-knot winds and huge waves. The yacht sank so quickly that the five-member crew barely had time to alert the U.S. Coast Guard and inflate the rubber dinghy, she says. During the next five days, the survivors battled dehydration, hunger, exposure and massive infections. No ships spotted the rubber dinghy and they drifted alone in an open boat. The crew eventually divided into two camps, Kiley says. Two men in the boat started arguing with and assaulting the others. They were falling apart emotionally and physically. Then the crew began to die. Two men couldn't take their thirst anymore and drank salt water. They became delusional and started hallucinating. 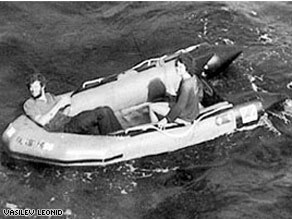 Both of them calmly slid off the dinghy into a sea full of sharks, convinced they were going to the store for cigarettes. They were killed by sharks -- one right underneath Kiley's dinghy, she says. A third crew member, a woman who suffered ghastly wounds to her leg when the yacht sank, soon died, Kiley says. Kiley wondered if she would be next. When sharks attacked one of the men in front of her, Kiley says that she thought she was going to have a nervous breakdown. "I closed my eyes and prayed and waited to die," she wrote in "The Sinking," an account of her survival. The sharks moved on, but Kiley had already made a series of small decisions that helped save her life, she says. Instead of expending much of her energy bemoaning her fate, she planned for survival. She covered herself with seaweed for warmth. She took on the role of protector, watching out for another man in the boat. She also made a ruthless decision. She kept her distance from two male companions in the boat who bickered and cursed with the others. She sensed that they were going to die and she didn't want to waste precious energy fighting with them. Even the act of prayer was a survival strategy. Kiley didn't know if she believe in God, but her prayer helped her avoid the loss of control that doomed some of her companions in the boat. "Surviving is about keeping your wits when everything is falling apart," she says. Kiley says she was also conditioned to be a survivor from her childhood. She grew up in rural Texas where she learned to survive in the outdoors. Her mother was married several times and was a victim of domestic violence. "I learned as child how to live and adapt to the environment I was in," she says. "You never knew what was going to come up." After five days in the open ocean, Kiley and another man were finally spotted and rescued by a passing freighter. She says the accident changed her. "I learned to accept people for who they are and who they're not," she says. "God doesn't need me to judge anyone else." Gonzales, who examined Kiley's survival in his book, says Kiley's background helped her survive. "She grew up having to fend for herself," he says. "She was also a very independent thinker and has strong ties at home to her mother. She had the whole package and was able to use her own anger to motivate herself." Kiley still sails when she can today. But she says there's hardly a day where she still doesn't think about the accident. She still has flashbacks from that night at sea that come at the oddest of times. "One minute I would be standing in the shower washing my hair and the next minute sitting in the tub sobbing uncontrollably," she wrote in her book. "And I was never free of the dreams." Today she lives in Texas where she is a fitness specialist and a yoga instructor. A Discovery Channel documentary was made about her ordeal at sea and she continues to lecture about her experiences while raising money for domestic violence charities. More than anything, she says, it was her will to live that helped her survive. "You can never give up," she says. "No matter how bad it gets, something good is going to come out of it." A little anger also helped her push through, she says. "It was enough to help me survive."